This article is a walk through of a process for designing a toroidal ferrite cored inductor for radio frequencies. Designing with magnetics can be a complicated process, and it starts with using reliable data and reliable relationships, algorithms, and tools. bait and switch where the seller pretends to sell brand name product, but ships a substitute that may or may not comply with specifications. One reputable manufacturer of a wide range of ferrite cores is Fair-rite. Lets use their databook as an example for design data. 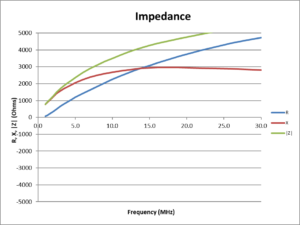 the ‘inductor’ is more completely a resonator. (1) is dealt with by using the correct complex permeability in calculations. 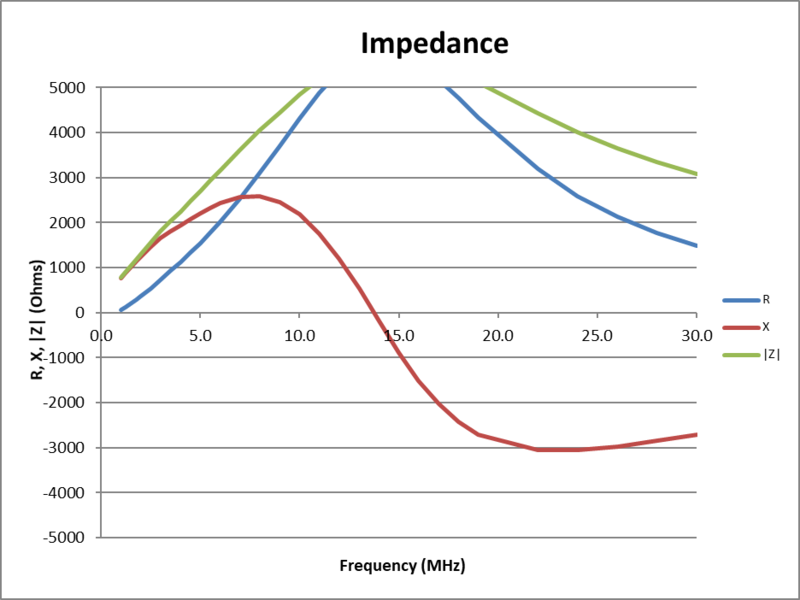 (2) has little effect at less than say one tenth of the lowest self resonance frequency, and up to about half that first self resonant frequency can be modelled reasonably well by a small equivalent shunt capacitance. Let work through two different formats of specification data, the first is common for ‘ordinary’ toroids, the second for ‘suppression sleeves’. Lets look at the entry for a 5943003821 which is known commonly in ham circles as a FT240-43. Here is a clip from Fair-rite’s catalogue 17th Ed. 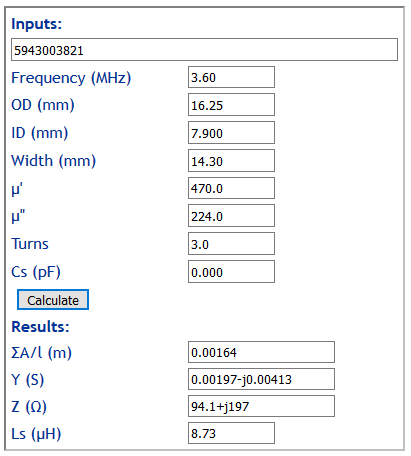 Lets find the impedance of an 3t winding on this core at 3.6MHz, firstly ignoring self resonance. Lets use Calculate ferrite cored inductor (from Al) . 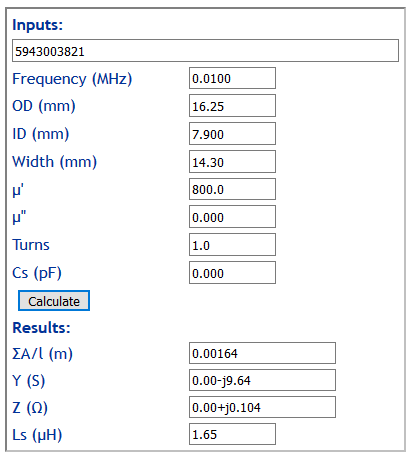 From the datasheet, is Σl/A 920/m (multiply the /cm value by 100 to convert). 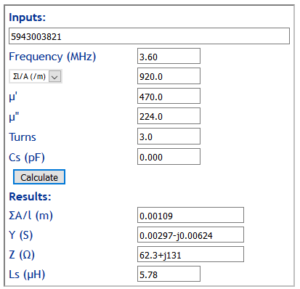 Lets use Calculate ferrite cored inductor – ΣA/l or Σl/A . The results reconcile well with the previous case. 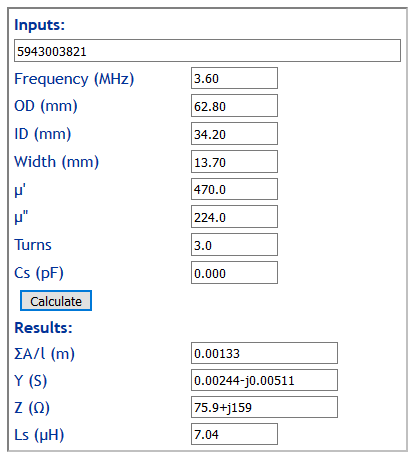 From the datasheet, dimensions are 62.8×34.2×13.7mm. Lets use Calculate ferrite cored inductor – rectangular cross section . The result is close to the previous cases, but a tiny bit higher as this model assumes sharp edges on the toroid whereas they are chamfered and that slightly reduces the cross section area. The error is small in terms of the specified tolerance of the cores, so it is inconsequential. Lets look at the entry for a 5943003821 which is known common in ham circles as a FT240-43. Here is a clip from Fair-rite’s catalogue 17th Ed, in this case the format is that used for many cores classed as suppression cores. 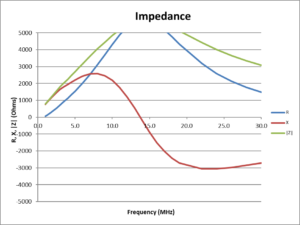 Al is usually calculated from measurement of impedance or inductance with a small number of turns at around 10kHz. It can also be estimated from initial permeability (µi) and dimensions, or Σl/A or ΣA/l. 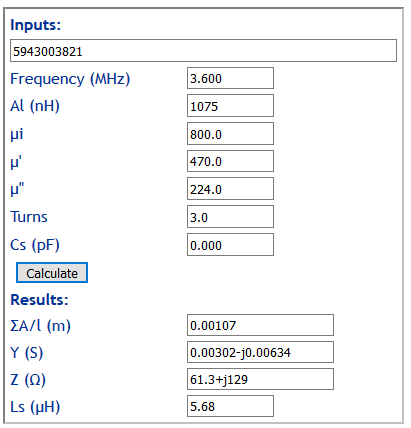 Taking the last example, lets calculate the impedance at 10kHz. Above, Ls is 1.65µH, so Al=1650nH. 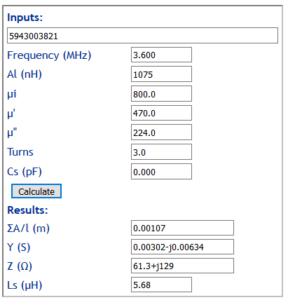 The calculator also conveniently gives ΣA/l=0.00164m, and of course Σl/A is the inverse, 610/m. If you measure L and divide by n^2, be careful that the measurement is at a frequency where µ=µi. As mention earlier, these devices are really resonators and exhibit self resonance. Up to about half that first self resonant frequency these effects can be modelled reasonably well by a small equivalent shunt capacitance. So the first step is to carefully measure the first self resonant frequency, carefully meaning to ensure that the test fixture is not disturbing the thing being measured. 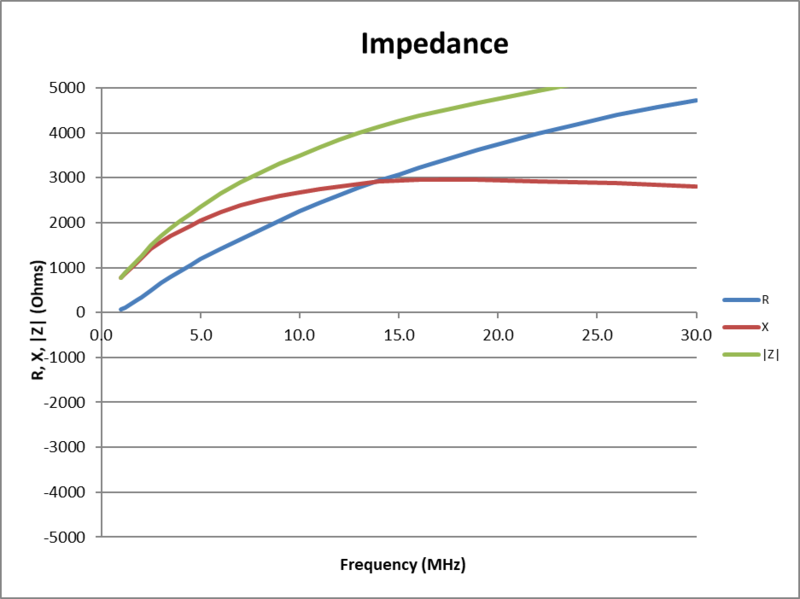 Above is a plot of calculated impedance for 11t on the 5943003821 used above. Above is the same scenario with Cs=2pF to calibrate the self resonant frequency to measurement of a prototype.